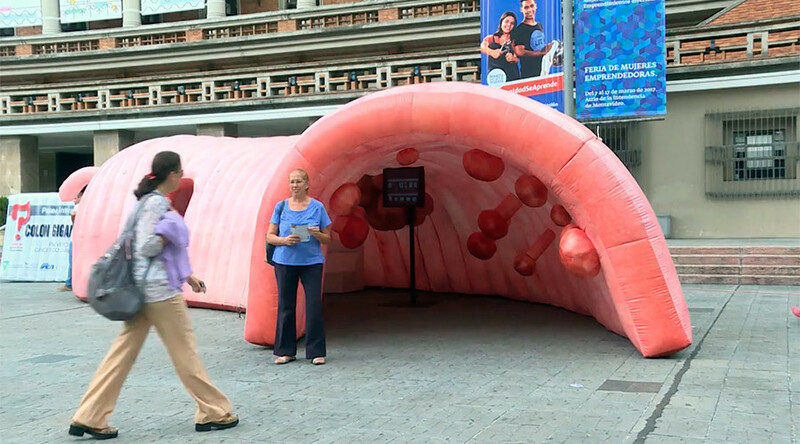 Visitors to City Hall in Montevideo, Uruguay received a lesson in cancer prevention after wandering into a giant colon planted outside the building. The inflatable colon was erected as part of an initiative to raise cancer awareness. Covered on the inside with lesions, the inflatable colon provides a walk-through tutorial on colon cancer and the methods of prevention. Representatives from the Digestive Cancer Center at the National Cancer Institute and the Honorary Commission for the Fight Against Cancer were in the colon to inform people. “It's good to inform the public. Skin cancer is easier to detect, this is a lot less visible,” one visitor said. Another described seeing lesions on the inside of the colon as he walked through it. "There are diseases like colon cancer that should not exist anymore, people should not die because of this disease," Dr. Álvaro Luongo from the National Cancer Institute told Montebideo Portal. Approximately 1,800 cases of colon cancer are diagnosed each year in Uruguay, with it being the second most frequent tumor in adults according to the country’s National Cancer Registry, reported the news outlet.